Wikipedia wrote: In the near future, scientists attempt to harness Earth's gravity for energy. The experiment fails and results in the devastation of much of the surface: nearly everyone and everything is thrown into a reverse gravity field and sent flying from Earth. 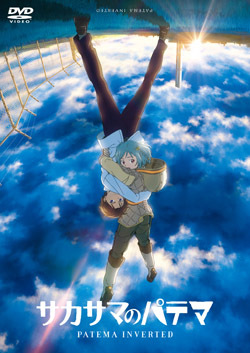 Patema is a respected teenage girl who lives in a society that dwells underground. The subterranean community imposes rules to keep its members away from "danger zones" in the tunnels that surround the community. Inspired by her friend Lagos, who has mysteriously disappeared, Patema explores the tunnels. One day, while looking at a large, seemingly bottomless hole, she is startled by a figure that appears to walk on the ceiling, and she falls into the pit. I highly recommend this film. I won't give any more away about the movie than is given in this portion of the plot summary posted above. It's worth the watch. The film is available online on Hulu, Amazon Prime, or at other free anime streaming sites, you'll just have to wade through ads to get the movie started. Enjoy!